the eric update – day 55: please keep your seatbelt tight and your hands safely inside the car. coincidentally, eric’s neonatal nurse practitioner was also on duty during his prior two “crashes” and made it clear that she was being hyper-vigilent. in a sense, it was reassuring to know that someone was watching his every move who was intimately aware of his ability to crash suddenly and without many of the normal warning signs ( trouble digesting food or bad blood gasses or immune cell counts ). she talked with us for quite some time about how strong a fighter he was, but that it can be more difficult to know how to treat him; unlike a “wimpy white boy” who will wear his ailments on his sleeve, he fights and fights and fights and looks fine, until he can’t fight anymore and crashes fast. when we talked in the morning, the n.p.p becky was leaning towards the theory that eric was suffering from a bug that wasn’t responding completely to his antibiotic treatments. looking over his record, she thought she could see a pattern of getting sick 4 or 5 days after being taken off antibiotics. by noon she was so convinced of her theory that was prepared to start him on “big boy” antibiotics ( the nurses term for antibiotics which are reserved for treating the nastiest of the nasty bugs ) even without any strong evidence that he had an infection. 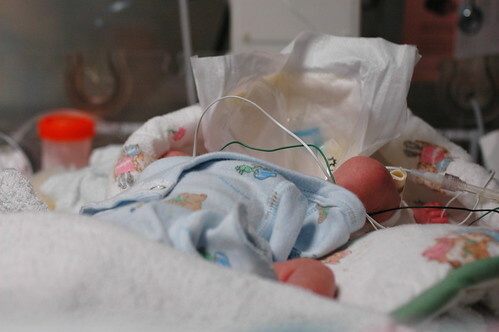 in the end, after hours of alarms and lots of theories about what may or may not be happening, they decided to turn up the rate of air flow on his nasal cannula and he stopped all of his “naughtiness” ( nurses term for when babies alarm ). it’s impossible to describe what it’s like to spend the day trying to muster the energy to yet again prepare for the worst, only to things quiet down after fiddling with knobs. a false alarm? we’ll know more if he makes it through the night without any more problems. after the staff turned up his flow, he start to get less listless and more active ( a good sign, since turning into the equivalent is one of the possible signs of an impending infection ). 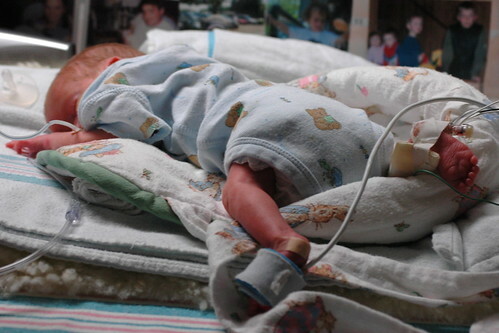 as we prepare to leave for the evening, eric decides that he’s ready to bust out of the nicu and attempts to wiggle off the radiant warming bed. Previous Postthe eric update – day 54: his first “onesie”! and non-nutritive suckling!Next Postthe eric update – day 56: the fourth. part five.